Browse our best selling wholesale charging accessories products- great if you're a little unsure about the best items to stock. Our top twenty wholesale charging accessories offers you the chance to see what like minded businesses are buying. Shop online and buy with confidence today. Here at Harrisons Direct we are a one-stop shop for all your best selling wholesale charging supplies and electronics. We stock a large selection of leading brands that your customers love including Duracell, Panasonic, Eveready and Groov-e all of which can be found in our selection of best selling wholesale charging supplies and electronics. Known and loved by many Duracell Plus Power Batteries are available in numerous sizes including AA, AAA, MN1400 and MN1604 9V. Eveready Batteries are just as popular and like our range of long lasting Duracell batteries they are available in a variety of sizes including AAA, 6V and 9V. Panasonic AA batteries are also a best selling wholesale charging supplies and electronics product. 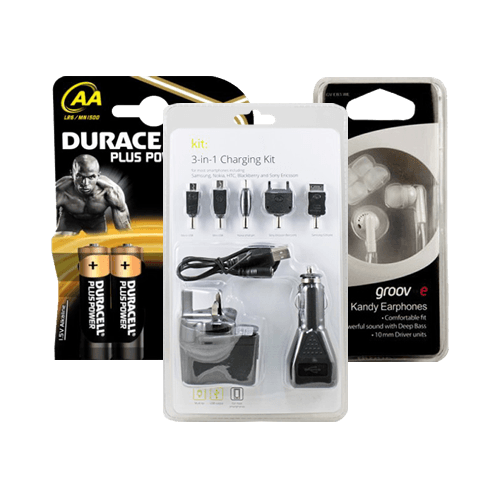 In today’s day and age charging mobile devices such as mobile phones and tablets on the go is extremely popular, so it’s no surprise to see the Kit Universal 3 In 1 Mains, In Car & USB Charger With 5 Tips Blister Pack amongst our best selling wholesale charging supplies and electronics. Other products in our range of best selling wholesale charging supplies and electronics include Wonder Holder a device designed to hold your mobile phone or sat-nav anywhere in your vehicle, Groov-e Kandy Earphones and Groov-e Streetz Stereo Headphones Black with soft ear pads and volume control. As a leading supplier of wholesale charging supplies and electronics we understand that a reliable and timely delivery service is vital to all our customers. We also understand the importance of customer service, which is why our customer care is second to none. For more information on purchasing items from our range of best selling wholesale charging supplies and electronics feel free to call us on 01254 306840.